Doubt progress in understanding uniqueness of this animal was achieved. Physical attributes have not changed (or very little) over 240 million years. Confirmed by assigning numbers to attributes, so statistical method could be applied. Well, it would be amazing if the numbers contradicted Darwin's judgment. Like, so what? Perhaps tuatara has an unusual amount of "junk" DNA. It is the junk DNA that is evolving. Somehow, the active DNA is not evolving, even though small, incremental changes should have minimal impact on fitness. The DNA repair mechanism may be adapted specifically to maintaining the active DNA, not the junk DNA. 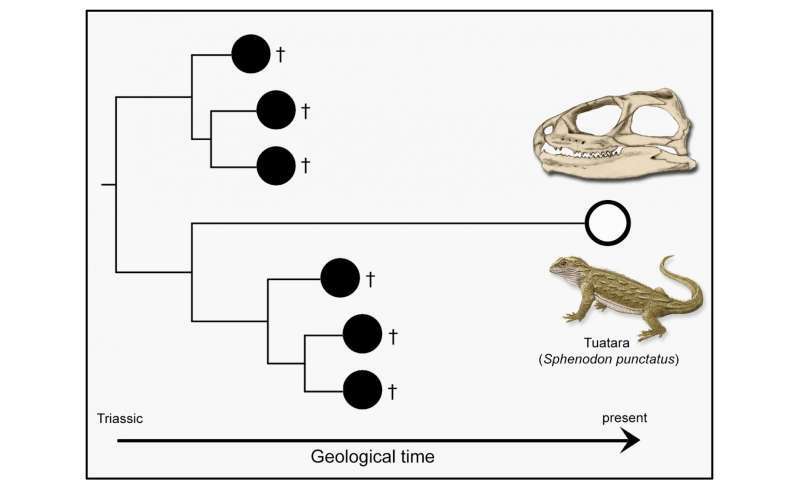 Of course, random mutations will still occur, but since tuatara is already optimally adapted natural selection gravitates back to the same traits.